It's time to show your hatred for objects with pointy bits! SpikeDislike2 brings back all your favourite themes, mixes them into all manner of different gameplay types, and throws all the spikes in your face! 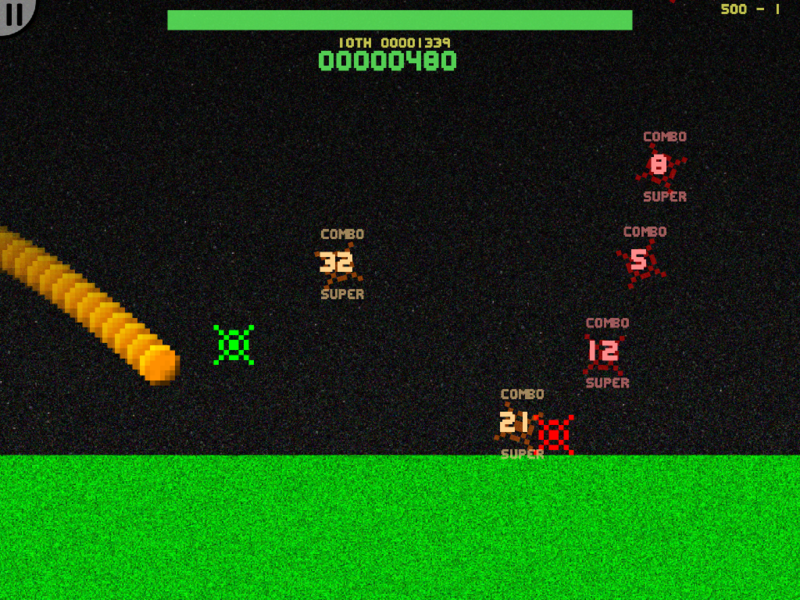 You can Download SpikeDislike2 FREE here for Windows, Android, or play in your browser! I was a little disappointed to find there was no AGameAWeek Gold waiting for me, this morning. I wondered... How often will it actually appear? Have I actually produced enough games to keep it going EVERY DAY? I wrote a little script to find out. AGameAWeek is meant to happen on Tuesdays. I've stated numerous times that SpikeDislike2 will be released on March 5th, which is also a Tuesday. .. But Apple.. .. Apple don't give you times..! On Apple's hugely chaotic iTunesConnect site, you can happily pop a Release Date into the mechanism, but there's no way to state a Release Time. Given that AGameAWeek happens on a Tuesday Morning, GMT, I can't then expect US folk to have to inexplicably wait an extra 6 hours, just because their timezone's slightly off mine. So, to be extra 100% sure that it's available, I instead set it to Monday March 4th. If you're in a compatible timezone, you may very well be able to go and grab it, RIGHT NOW. And if it's not yet available, it definitely should be by the time I post tomorrow's AGameAWeek post! Official Launch Day : March 5th, 2013! I've been considering doing this for a while, but never bothered to come up with any sort of Database Scanner to find old posts. I'm lazy like that! Luckily, a new iOS App has come along to save me the trouble. The wonderful "TimeHop" is available (for free), and allows you to upload your Twitter Archive, as well as include your Facebook timeline.. What it then does is scan the archives for things that have happened on this day, and present you with a nice look back at all your old gubbins. Since I've spent the past 7 years tweeting about my weekly projects, it's been throwing up a lot of nostalgia. Some of it's good, some of it's baffling, and .. curiously.. some of it seems to be exactly the same. For example, I've spent the past couple of weeks reading two year old tweets about the complexities of getting SpikeDislike into the AppStore, while simultaneously battling those exact same complexities getting SpikeDislike2 into the AppStore! Weird!! Anyway, it brings back old stuff, and so I've decided to use it's wonderful feature to bring old stuff back, here, too! And.. curiously timely today's is, too!! SpikeDislike2 - Coming - Tuesday! Before today, there's been that niggling doubt. If SpikeDislike2 didn't get Apple Approval, the whole thing would have to be rescheduled. This morning, SpikeDislike2 received it's Apple Approval! 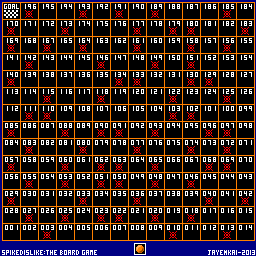 Tuesday March 5th 2013 is officially SpikeDislike2'sday! It's our latest regular feature! Hurray! Each month, I'll spend about five minutes doodling some stupid pixellated artwork, then scale it up to insane proportions, and slap it on the internet for all to see. 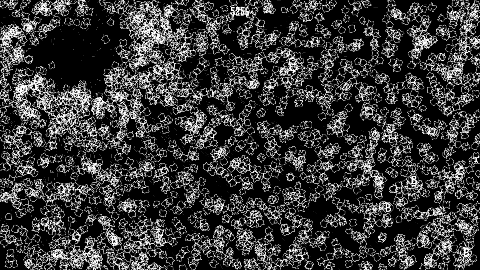 If you like the chunky, heavily pixellated, oversized desktop images, you might like to use these as your system/devices wallpaper. This month, an obvious choice! SpikeDislike2 is just a few days away, so here's a lovely big wallpaper for your system of choice. What did I do, today? 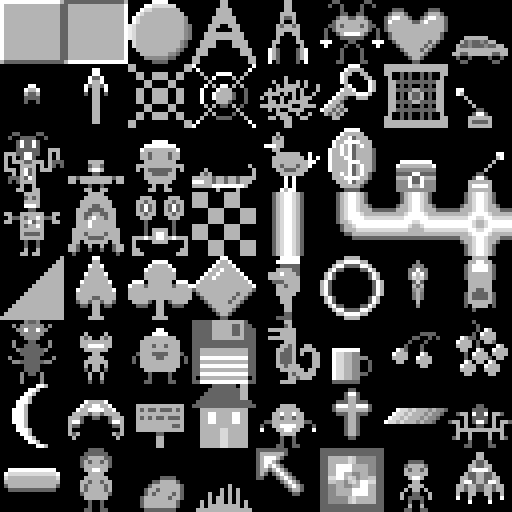 Well, first I made Blockman Slots, then I wondered what to do next..
Then I figured, since I wasn't actually doing anything, I might as well load up "Sprite Something" on the iPad, and waste a couple of hours drawing a whole batch of random sprites. So, here's a whole batch of random sprites!! 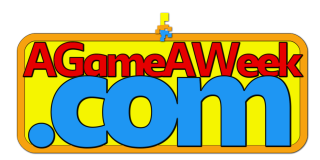 Look out for these, and more, in future AGameAWeek games! Good Grief, it's been a long long time since a little video clip caused utter chaos in my Twitter feed! I feel that last night's occurrence needs a little explaining, because people are WAY more hyped about it than they probably should be!! WARNING : The "Gameplay" is merely an animation. JNKPlat Slots is 100% Random! Last night I had a random idea, and drew up a silly board game. Since then, the idea has annoyingly festered, and so this morning, I'm doing a complete relaunch of yesterday's silly idea, complete with all new advanced rules! Head inside for more details. 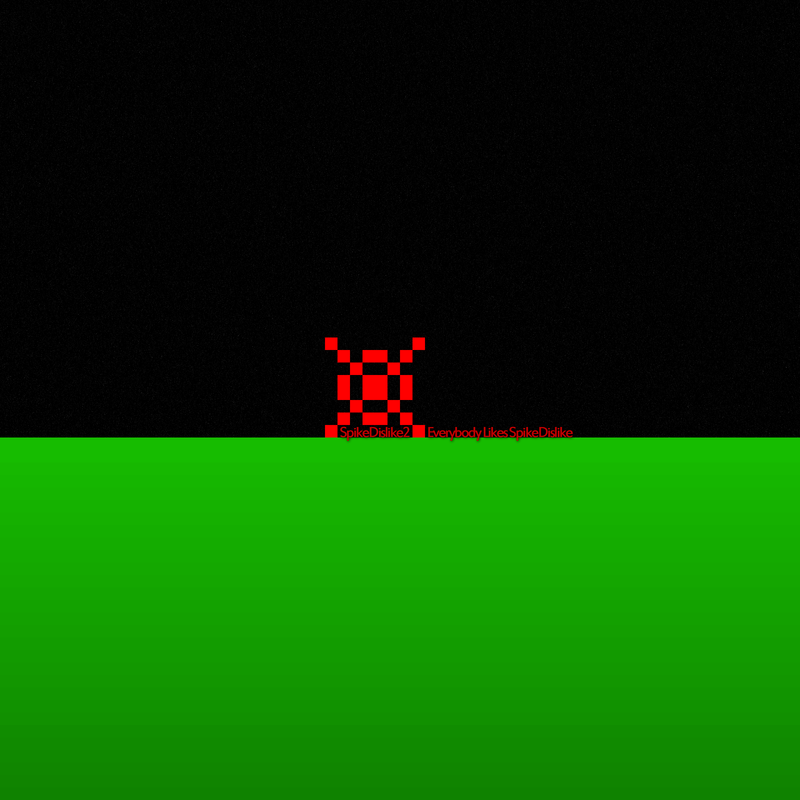 It's been 4 years since the last Blockman Gets game was released, so it's about time we had another! Blockman Gets Hungry strips out the boulders, takes out the power-pellets, and instead uses fruit for various functions. There's four different fruit to eat. See if you can figure them all out!! You can Download Blockman Gets Hungry here for Windows, Android, or just play it in your browser. Blockman is HUNGRY! He likes to eat. He doesn't like to NOT eat! Keep moving around the maze, nibbling away at the pills that are strewn around the arena. The round is over if you find yourself in a spot where you can't eat any more. If you've eaten enough, you'll move onto the next level. 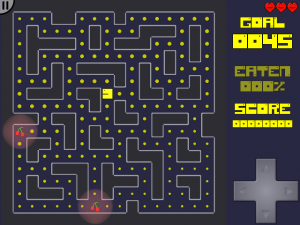 You may use any of the following control schemes to play Blockman Gets Hungry. 4. 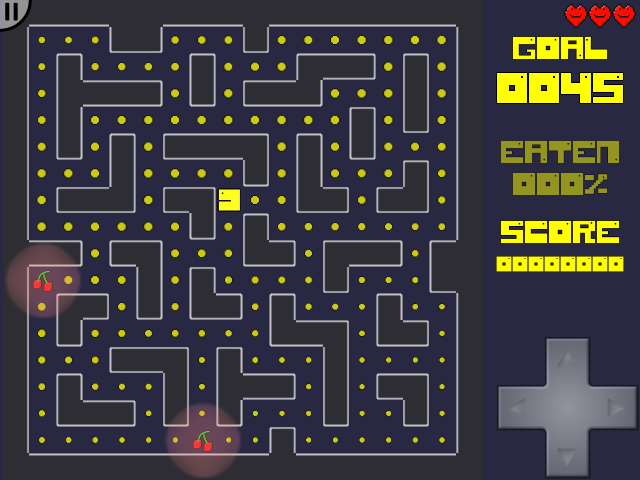 "Goto" : Tap/Click inside the Maze area to move roughly in that direction. 5. "Swipe" : Swipe-pad, works like the D-Pad, but is swipe-based instead. 6. "Path" : Draw a path in the maze, then let go, to have Blockman run around, following the path. If you pause the game, you can switch between DPad and Swipe, and Goto and Path. You can also change Blockman's move speed in the pause menu, incase he's moving too fast, or you don't like how he keeps stalling. Blimey, that's a lot of control schemes!! An iOS Edition is in the works. It'll be marginally bigger, will include GameCenter additions, and will have one of those price tag thingies. AGAW Scoring : 9 weeks, 9 games, all is good. .. and next week is SpikeDislike2!! A random oddball thought, resulted in this. Drawn entirely using SpriteSomething on an iPad. .. Yes, I actually sat here and draw all those numbers! ... Bored? You bet!! You start in square one, and make your way as far through the board as you can. If you hit a Spike, it's game over! If you make it to the goal, you're a Pro at random chance!! A single orange player counter has lovingly been provided.. If you'd like some multiplayer action, you're just going to have to improvise! I've updated the uploaded Jayenkai Monkey Framework to the latest version that I'm using. Downloads have been removed due to..
A) Lack of people using it. B) Lack of ME even using it. C) It's quite old, now, and getting older every day! It's been a whirlwind of a month, and I've not really kept track of everything I've added and tweaked, but the biggest addition is GameCenter integration. As long as you're using Monkey v67e or above, the GameCenter stuff will log the player in, and update their highscores and badges automagically. Simply tweak the LeaderBoard and Badge variables up near the top, and all should be happy. As always, feel free to rejig wherever necessary!